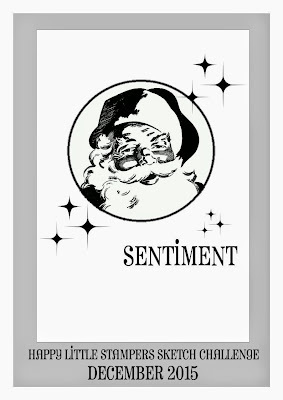 I am continuing my Christmas cards/projects target and this is another card I made today. 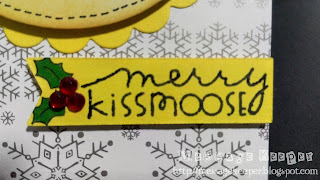 For this card, I am adopting simple Happy Little Stampers (HLS) December Sketch Challenge as shown above. The moose is stamped on a white circle. A Christmas hat is added to its head to make it more Christmas feel. The images are colored using Copic markers. Then, some faux stitching are added to the edges of the circle before it is distressed to tone down the whiteness. It is attached onto a yellow scalloped circle using foam tape. 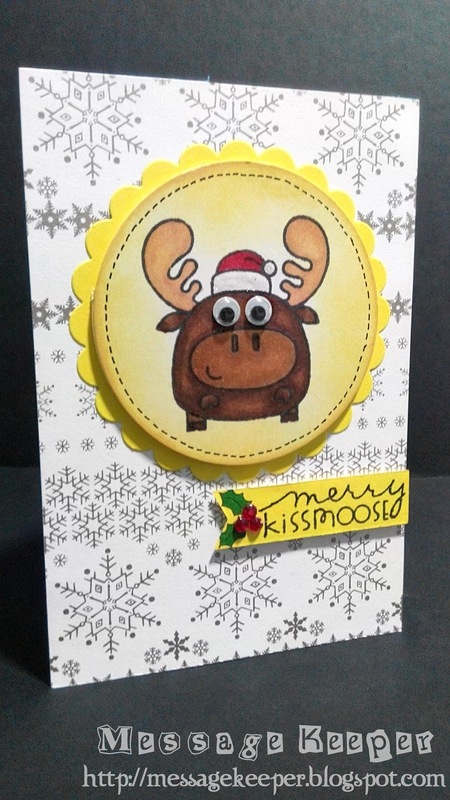 Two (2) giggle eyes are added to the moose. A snowflakes pattern paper is trimmed and attached onto a card base. 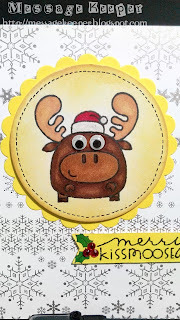 Then, the scalloped circle with the moose image is attached onto the card as in sketch. The sentiment is stamped on a tiny die cut fishtail yellow banner. 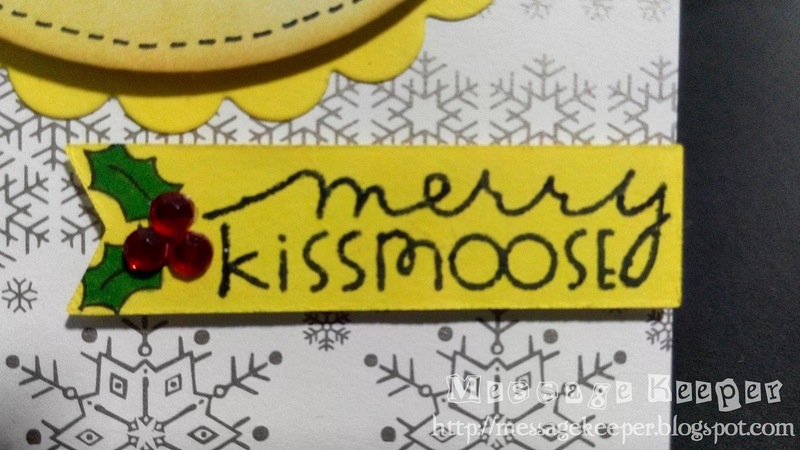 On the fishtail end, two (2) mistletoe leaves are stamped according to the banner end and colored using Copic marker. I decided to use red gems as the berries which add some dimension. It is attached onto the card using foam tape. The card is finished off with adding some shimmer to the white areas of the Christmas hat. 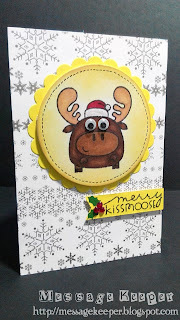 This is such a fun card and that moose image is adorable!! 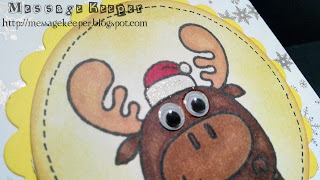 Thanks so much for joining the Happy Little Stampers December sketch challenge. A great fun card, super colouring and desisgn. Thanks for joining us at MTTC Caz DT. Absolutely adorable card! 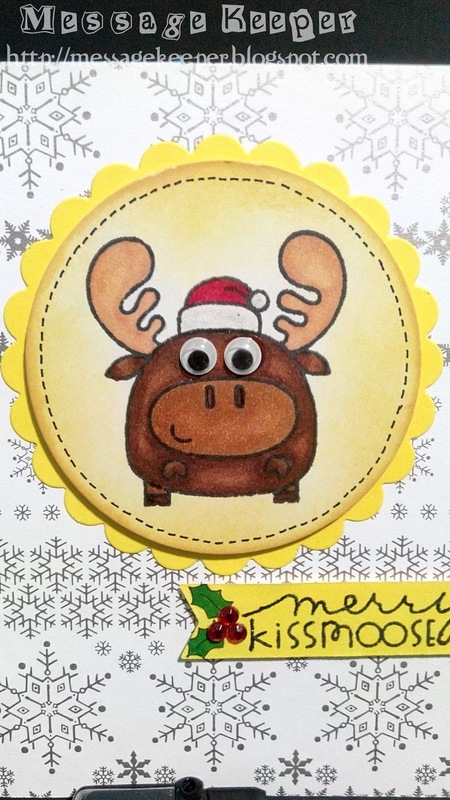 Love the googly eye moose! Thanks for joining us at Just Us Girls! This is stinkin' adorable!! Love that moose with the big eyes! Thanks for joining us this week for the Just Us Girls challenge!